Hamilton introduced three very innovative models in 1956 with unique hour hand configurations that allowed you to tell the time in several different locations by referring to references on the dial. One of the models was the Cross Country with a manual wind movement. 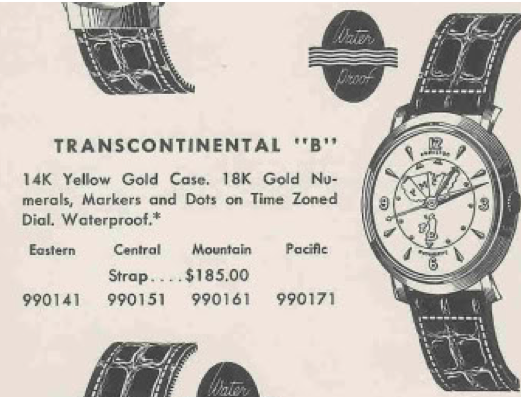 The other two models were automatics… the Transcontinental "A" and Transcontinental "B". The Transcontinental "A" was produced for two years. 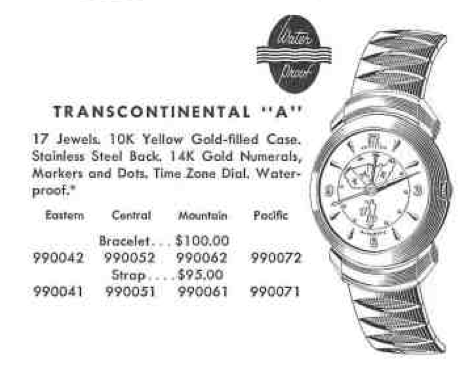 The Transcontinental "A" shared a 10K gold filled case with the Automatic K-455 from the same year. 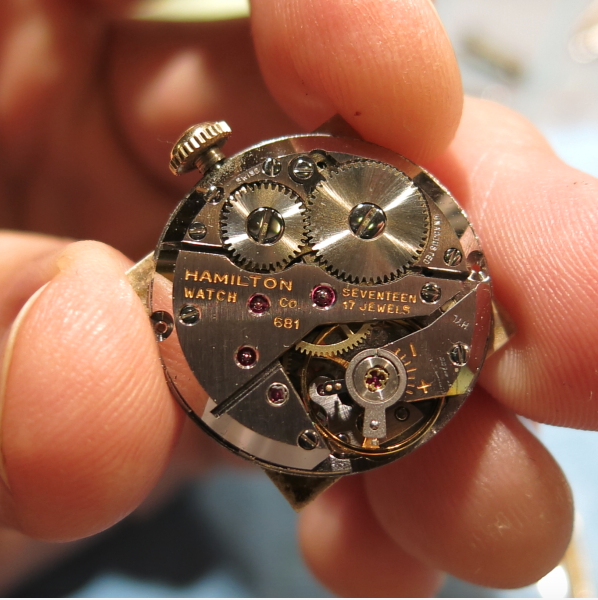 It also shared the same movement, a Swiss-made Hamilton 661 17-jewel grade. But the dials were certainly different. 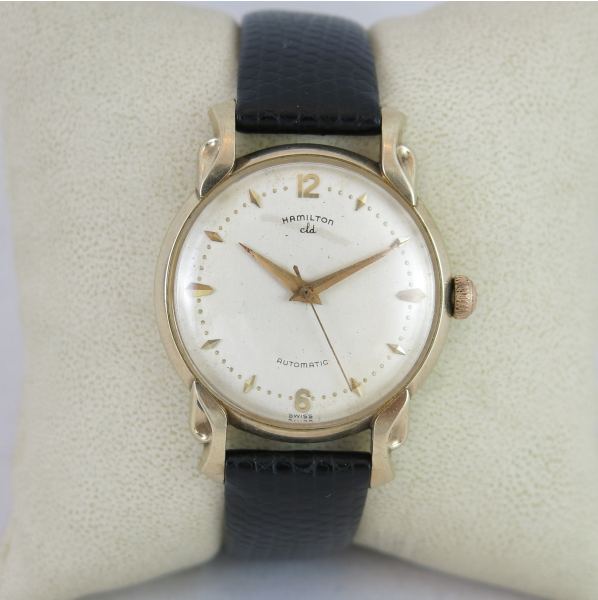 The "B" model shares the same dial and movement but came in a solid 14K gold case with different lugs. I've had the opportunity to see a Transcontinental "A" first hand and see how it works. Like the Cross Country, the hour hand has a dial plate mounted below the hour hand on the hour wheel. The hour wheel is the part that the hour hand normally attaches too. As you can see on the photo below, you can rotate the dial plate to set the hour hand according to the map on the plate… the four US time zones or Greenwich, England, as indicated by triangular makers. I suppose you could do Hawaii too - although that's not on the dial. As the hour hand moves, the dial plate rotates too. As you can see, this watch is set to Central Time, just like the watch in the catalog ad. It's a very interesting watch, isn't it? If you were to ask me what my favorite Hamilton watch is I would have a very difficult time giving you a firm answer. It's easier to identify the ones I don't like more than the ones that I do. For example, I'm not a big fan of the highly contoured 1950's models with pointed ridges and matching pointed bracelets. 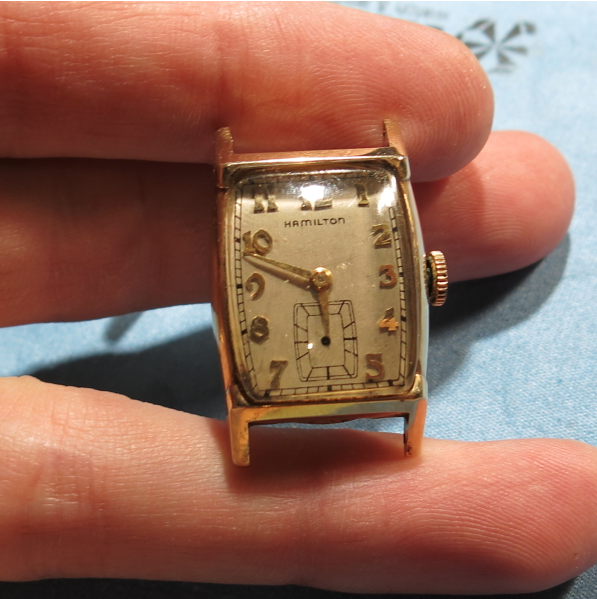 I don't care much for the really tiny men's watches from the 1940's either. 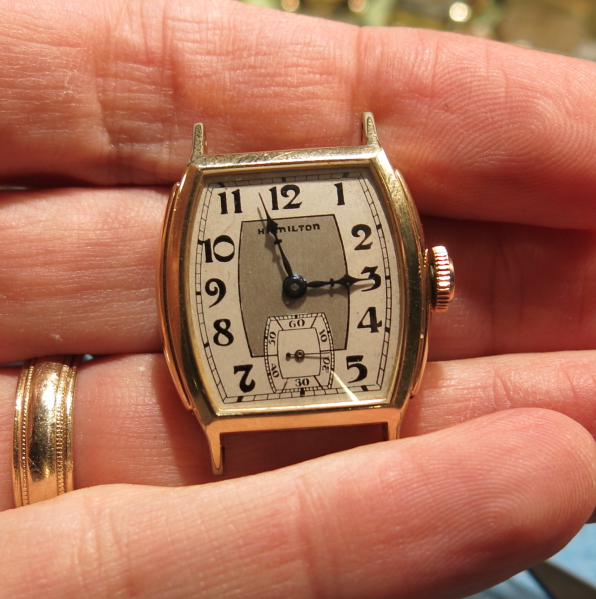 To each their own, I say - but I find the watches that are of the most interest to me are from the 1930's. 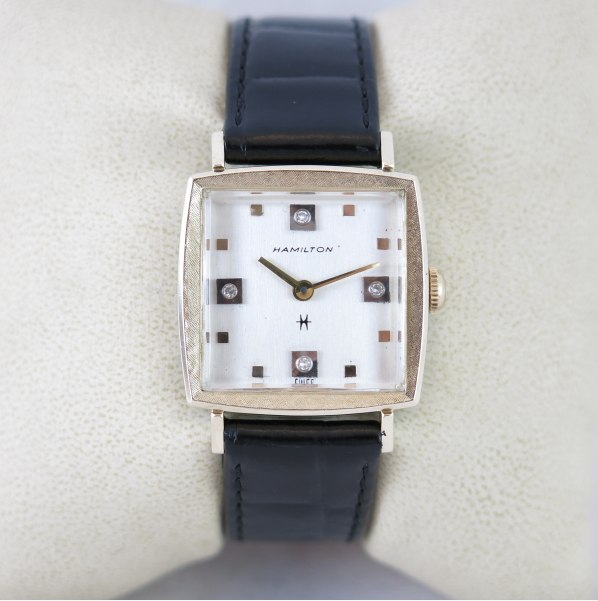 Many of the watches from the 1930's used Hamilton's 6/0 size movements, the 17 jewel 987 or the 19 jewel 979. 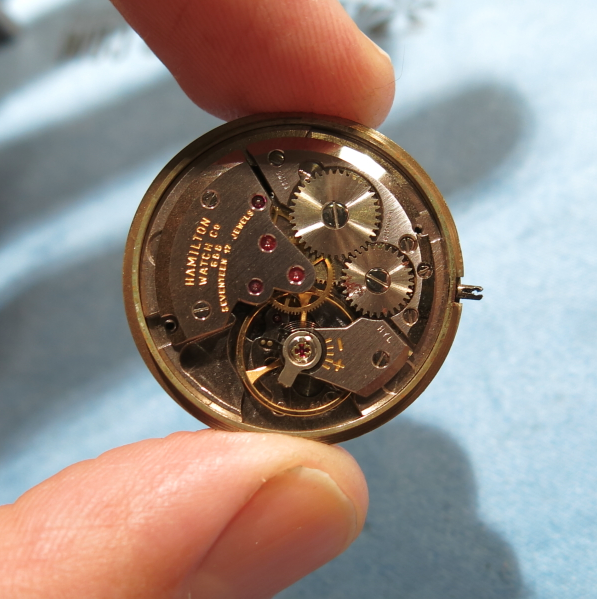 These larger movements were often installed in larger cases - so the watches are usually a nice size, even if they are small by today's standards. 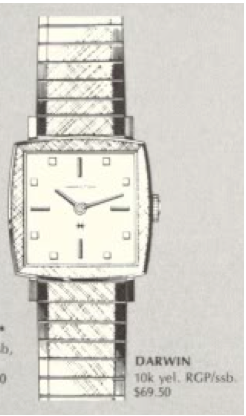 In addition, Hamilton typically offered multiple dial designs for the various models so the same model could take on a significantly different look depending upon the dial choice. 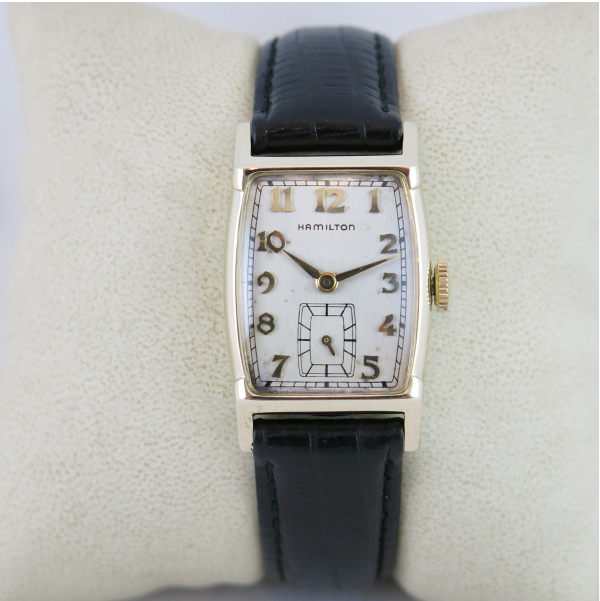 A great example of a sharp looking 1930's watch is the 1936 Morley. It was only produced for two years. If it looks familiar to you, it might be because it shares the same case with the 1941 Douglas. The Morley came in a 10K gold filled case in yellow only. Two dials were available, a black enamel numeral dial or an applied gold numeral dial with a wood-grain textured finish. Behind the dial you will find a 987-E movement or a 987A with a very low serial number - since that was introduced in 1937. Hamilton didn't distinguish between the various 987 movements. 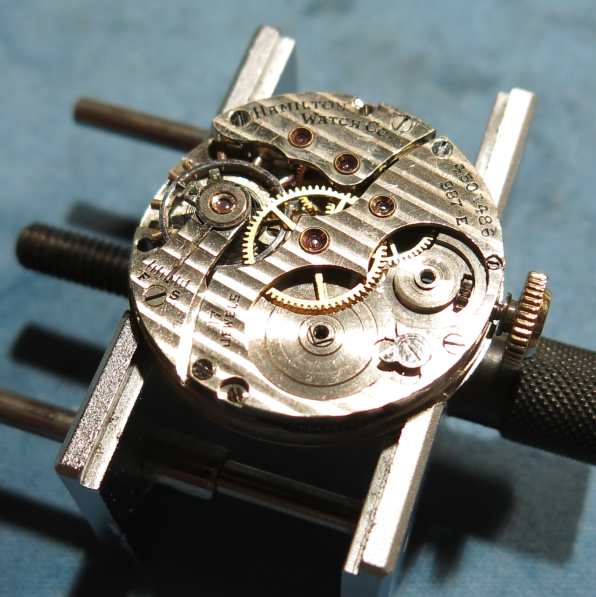 They simply referred to them as 987 movements, even when the original 987 had long been discontinued. As you might surmise, I recently received a Morley project watch. It was in very nice shape - so nice you might have thought it was locked away for the last 75 years. When you see a Morley "in the wild" you will almost always see it with wear-through to the lugs extending up to the corners of the crystal. 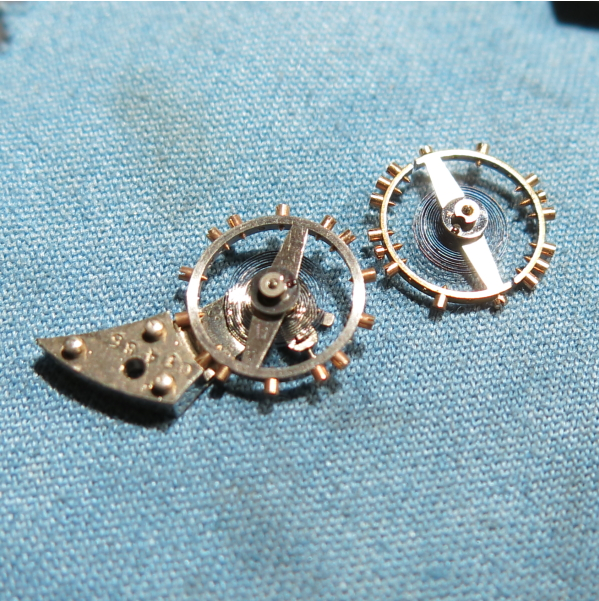 This example shows just a tiny bit of wear to the tips of the lugs - so this watch got some use but not much. I bet it was for "special occasions". The dial looks really good… maybe a little too good to be 77 years old. I suspect it's been refinished but they did an excellent job on the two-tone white & butler finish. The 987-E is very similar to the 987-F with a few small differences. 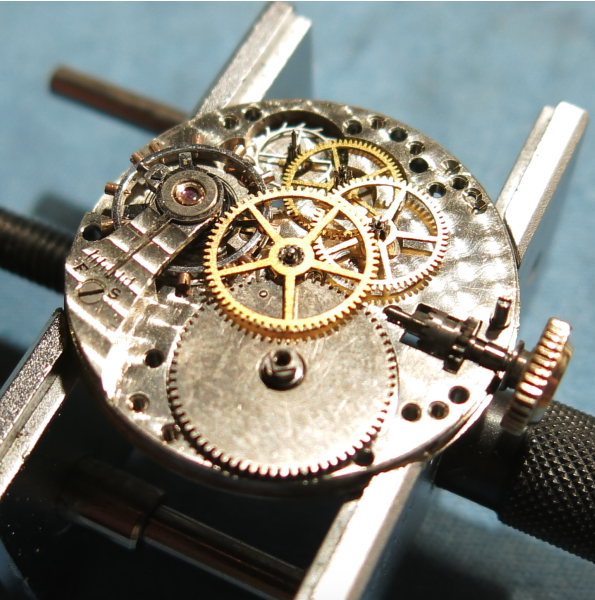 Both movements have friction-fit jewels, that's where the 987-F got the F, as in Friction. Plain 987 movements have jewels held in place with screws. The 987-E was given a new monometalic balance with an Elinvar hairspring - that's where the 987-E got the E, as in Elinvar. But the balance is slightly different too - as I'll point out below. 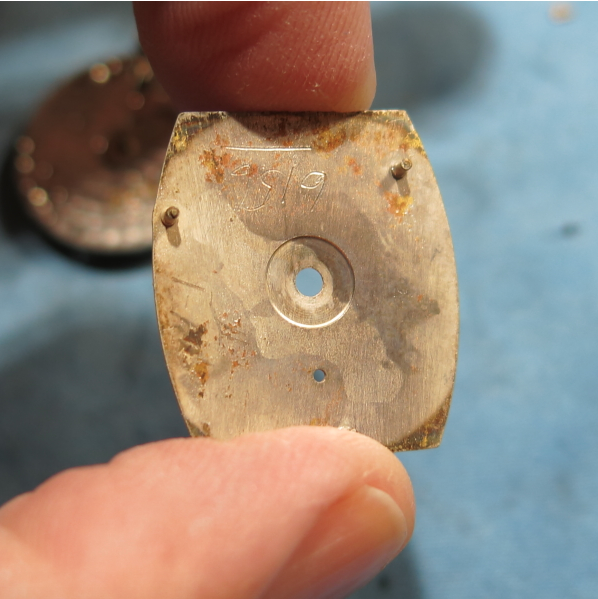 Sure enough, the back of the dial has some numbers scratched in - a sure sign of a refinish at some point. 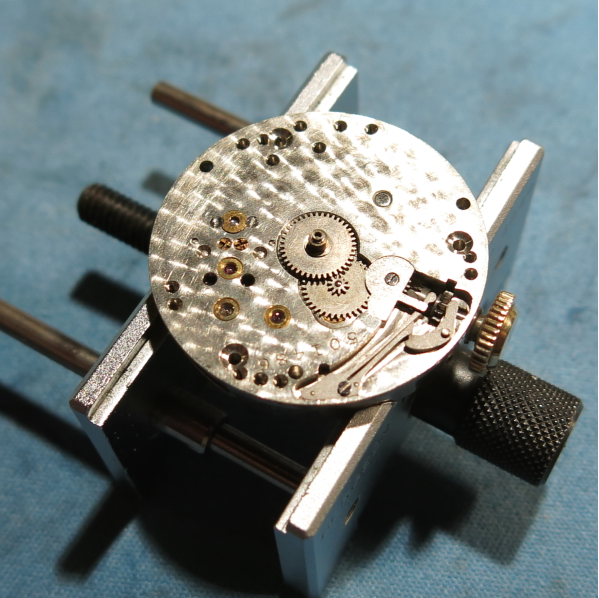 With the movement secured in the holder, the first things off are the hour wheel, cannon pinion, minute wheel and setting wheel. 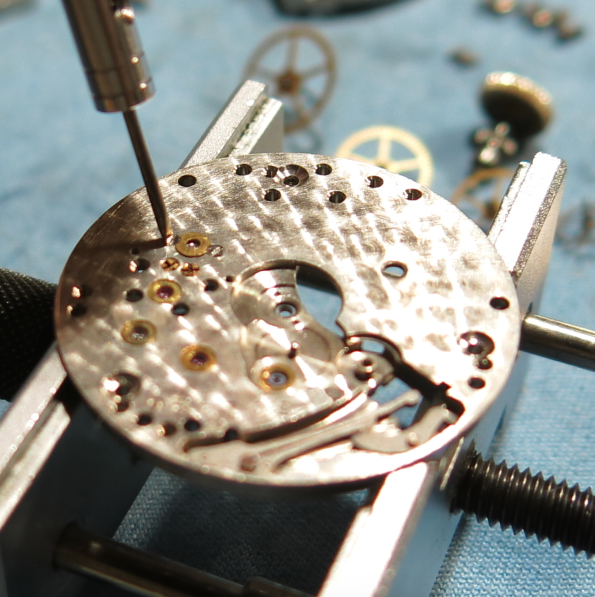 I leave the set lever spring in place and the stem, winding pinion and clutch will fall out once I disassemble the back. 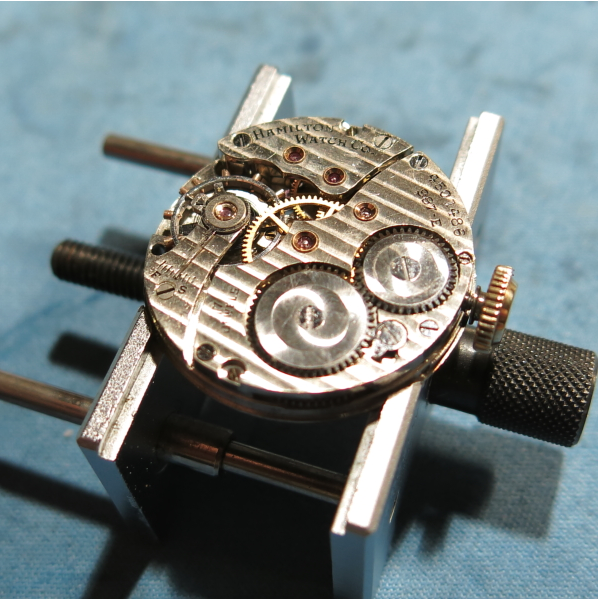 The next step is to relieve any remaining power in the mainspring. 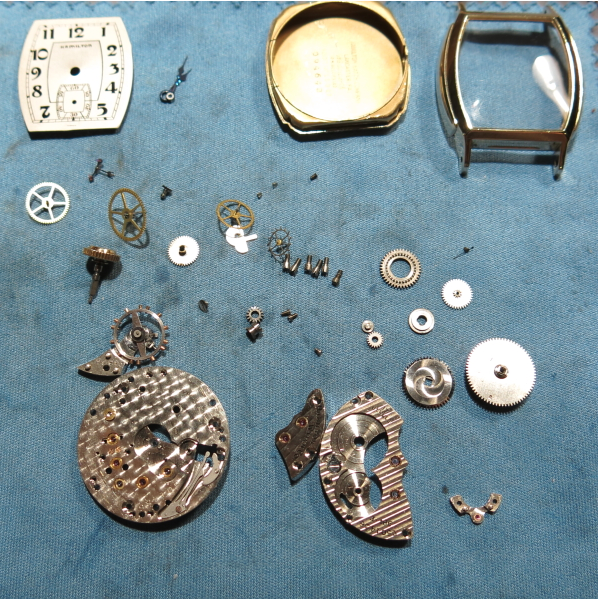 However, this watch has a broken mainspring - I suspect that because it winds and winds without ever getting tight. 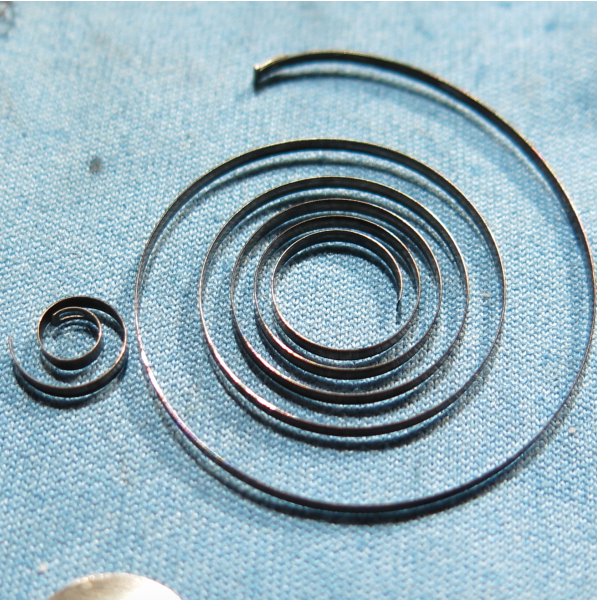 There could be other reasons for that too - but the most common cause is a broken mainspring. So, with no power remaining in the works, I'll remove the ratchet wheel and the smaller winding wheel next to it. Now the five bridge screws can be pulled out and that will free the barrel bridge and train bridge for removal. With the bridges out of the way you can see the gear train. Starting from the bottom you have the mainspring barrel, then the center wheel (which drives the minute hand), then the third wheel, the fourth wheel (which drives the second hand), and finally, the steel escape wheel. Power is transmitted through the gear train and held in place by the pallet fork. When the balance wheel swings past the pallet fork, it moves it and allows the escape wheel to rotate just a single step - thus rationing the power out slowly, five times per second. With the balance out of the way you can see the anchor shaped pallet fork tucked under it's bridge. The two ruby jewels at the prongs of the fork are two of the 17 jewels in the watch. There's a jewel holding each end of the arbor (axle) supporting the pallet fork, which brings you up to four jewels out of 17. Everything is now stripped off the back of the watch. There's one last thing to remove, and thats the cap jewel that covers the upper balance jewel. 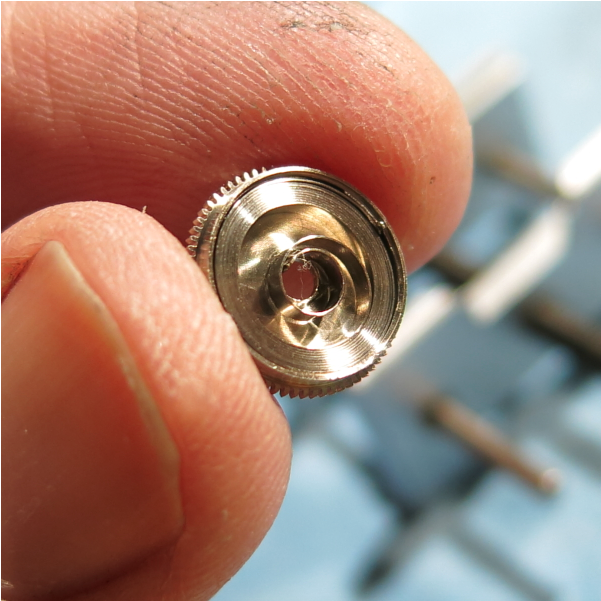 Two of the tiniest screws you've ever seen hold it in place. 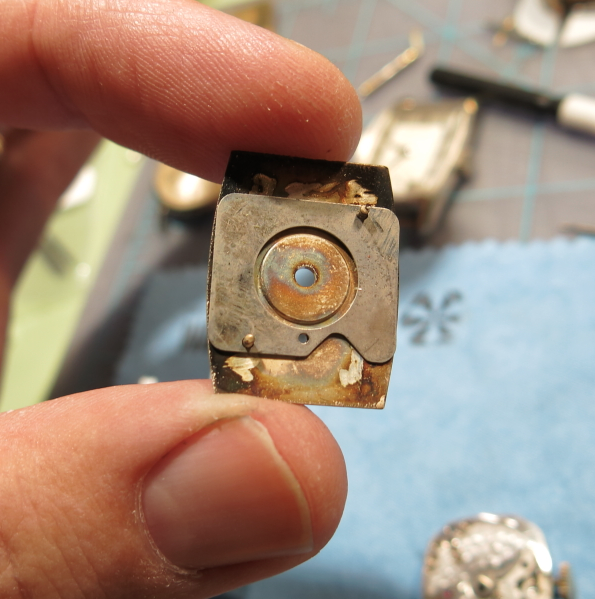 Well, there's no disputing that this watch needed a new mainspring. It was "set" anyway and would have had to be replaced just the same. You can still find original blue steel Hamilton mainsprings but you need to be careful as any rust on them at all will cause them to break. 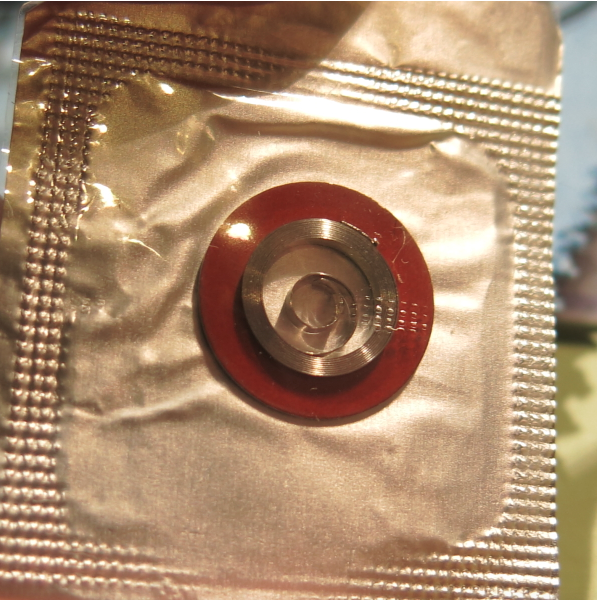 The best insurance is to get a white alloy mainspring - they're more expensive but they last a long time. I have found that even though the spring comes pre-coiled, when it comes to installing it in a 987 barrel, there's a lip in the barrel that catches the spring and stops it from going in. The 987A barrel works fine - but it's different than the 987, 987-F and -E barrel. So I'll uncoil it and rewind it with my mainspring winder. This tool makes it a breeze. Here it is installed in the barrel, along with a piece of lint that I removed after taking the picture. While everything is being cleaned, I turn my attention to polishing the case. I use Simichrome polish and a super-soft buffing wheel. It sure polished up nicely. Here's the 987-E balance assembly on the left and a 987-F balance on the right. They look pretty similar. The 987-F balance is a "compensation" balance. It is split in two places to allow the wheel to expand or contract slightly and compensate for changes in temperature. This is sort of like how a figure skater puts their arms out or in to spin more slowly or faster. The 987-E got the new "elinvar" hairspring and a mono-metallic solid balance wheel so the impact of temperature was controlled differently. The 987A has the same balance assembly except the hair spring stud is shaped differently - so you can't swap them around unfortunately. With everything cleaned and dried - re-assembly is basically the reverse of disassembly. 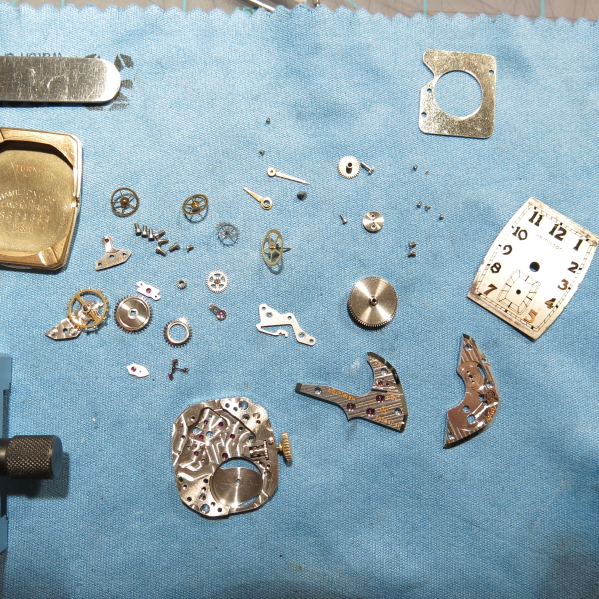 I had a really, really, hard time getting the watch to run right when I finished assembling it. It would run fine dial up, dial down, crown up, crown down but it stopped at the 6-up position. I fiddled with it for about two hours before tearing it down again and making sure the balance jewels were all seated correctly. I was just about to throw in the towel when I gave it one last go - and it worked! Yay!!! 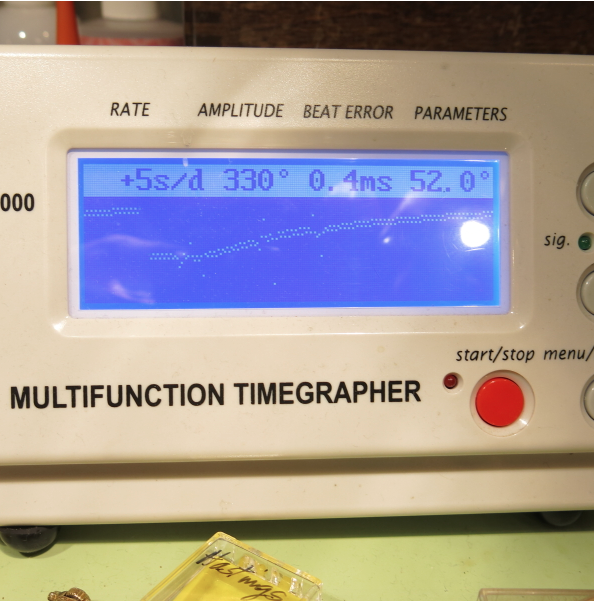 So with the balance assembly reinstalled and the watch purring away nicely it goes onto the timer. The beat error is a little higher than I would like but adjusting it is a real pain and a recipe for disaster - so it will have to do. And here's the finished product, all polished up and on a fine black lizard strap. It's a real beauty, I think. 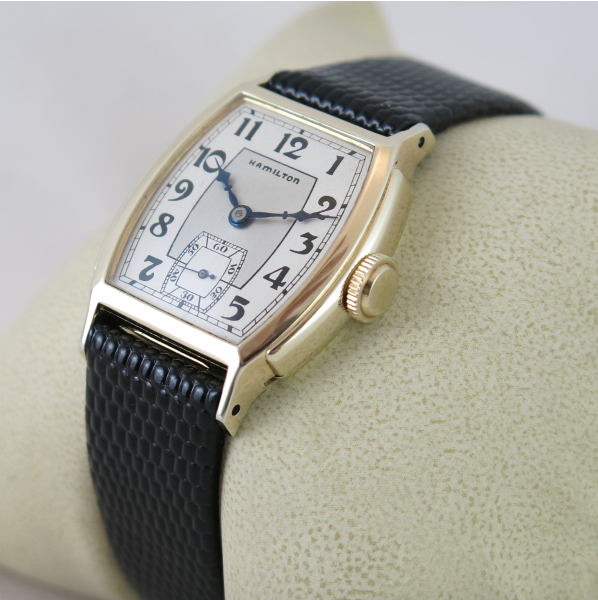 It's easy to see why the 1930's watches are among my most favorites. 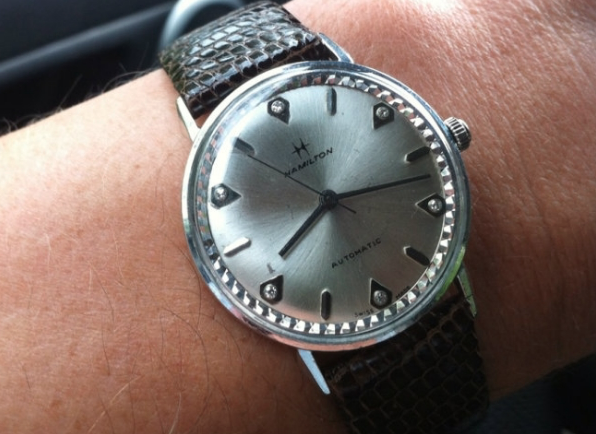 I posted earlier this month information about diamond-dialed Hamilton's and the Lord Lancaster line of models. 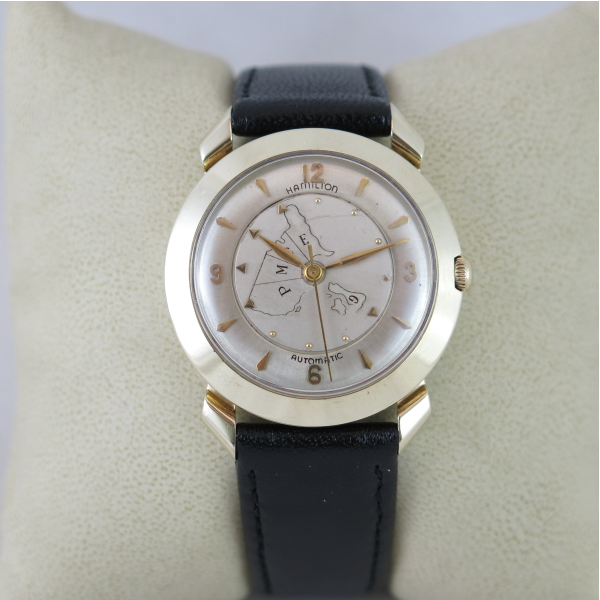 These 1960's era watches came in all shapes and sizes and are normally found in white gold, gold filled or rolled gold plated models. However, there are a small few Lord Lancaster models that were also available in yellow. One of them is the 1966 Lord Lancaster K. It was produced through the end of US production in 1969. The Lord Lancaster K came in both white or yellow 10K RGP. 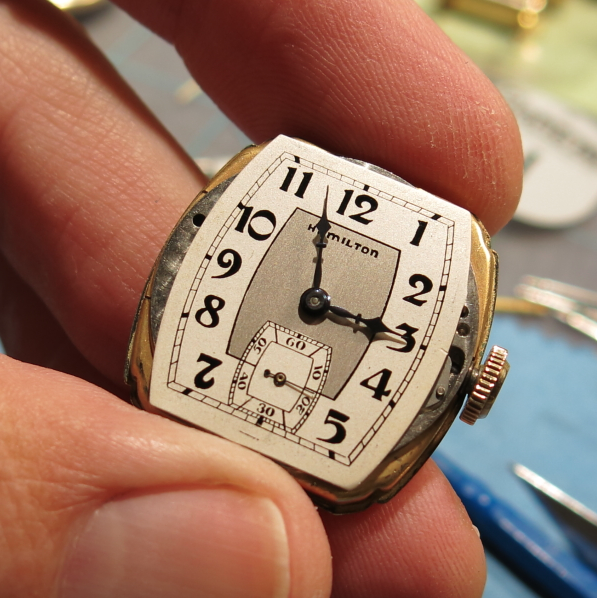 The butler-finished dial has matching hour markers (white or yellow) and the 12, 3, 6 and 9 have diamonds. Without the diamonds, the same watch would be called a Darwin. Unlike the Darwin, the Lord Lancaster K came only on a black suede strap. There's no matching bracelet. I recently picked up a Lord Lancaster K project watch. It was a little dirty and scratched up but not so bad that it wasn't a promising project. The original dial is in very good shape. There are a couple of minor age spots but it's otherwise unblemished. 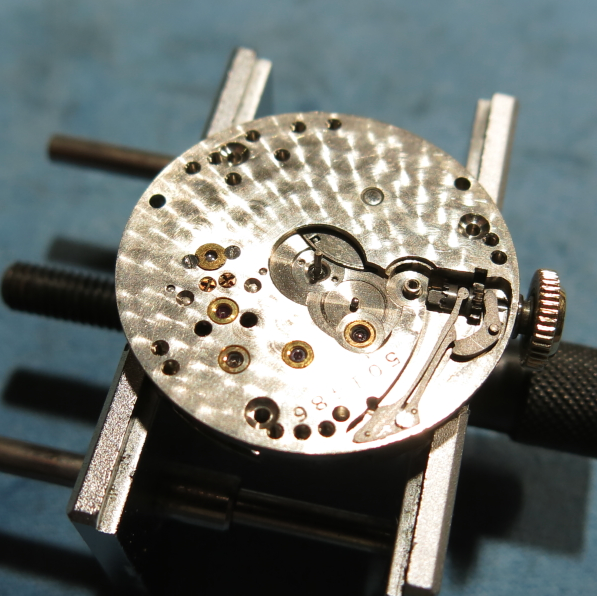 Behind the dial is a Swiss-made 17 jewel Hamilton 681 movement. It looks like an A Schild movement of some sort like the 686, but it's a slightly smaller size. 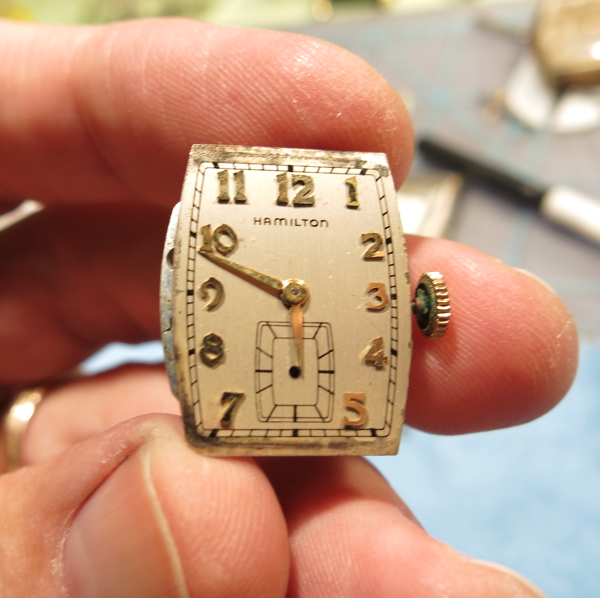 It's very important with diamond-dial watches to make sure the inside of the case back is marked Hamilton Watch Co. Lancaster PA. If it doesn't say that, then it's not an authentic model. With the movement freshly overhauled, the case and crystal polished and the a new black strap installed, this Lord Lancaster is ready for wrist time. It's not a very large watch and although it's a man's model, it's probably better suited for a woman by today's standards. Automatic movements are self-winding movements that wind as you wear them. 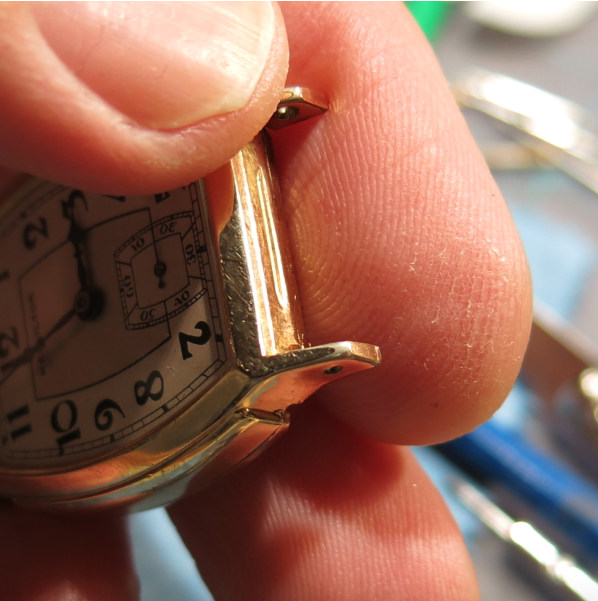 You can also wind them manually by the crown, like a mechanical watch. 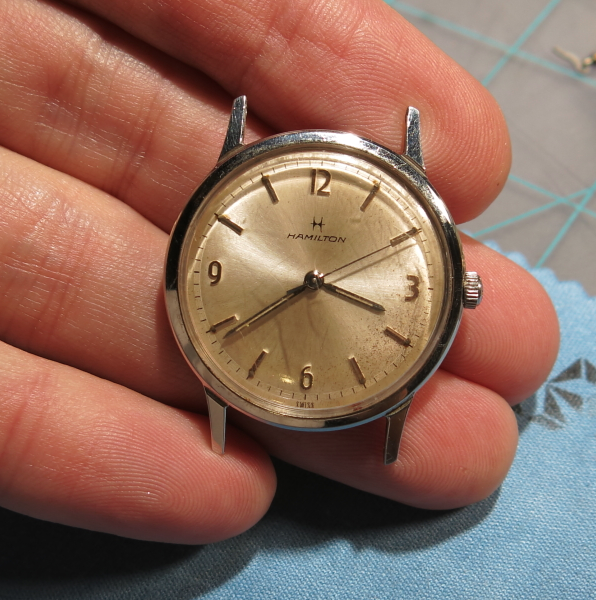 Some Swiss makers introduced automatics in the 1930's but Hamilton didn't introduce them until 1954, when they added the 12 new models - including their first calendar watch too. 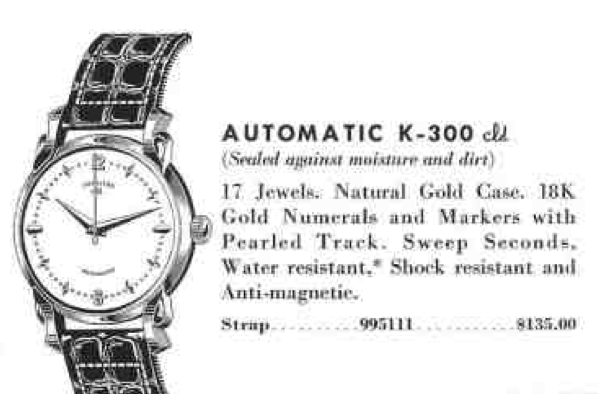 One of the 1954 watches was the Automatic K-300 CLD. 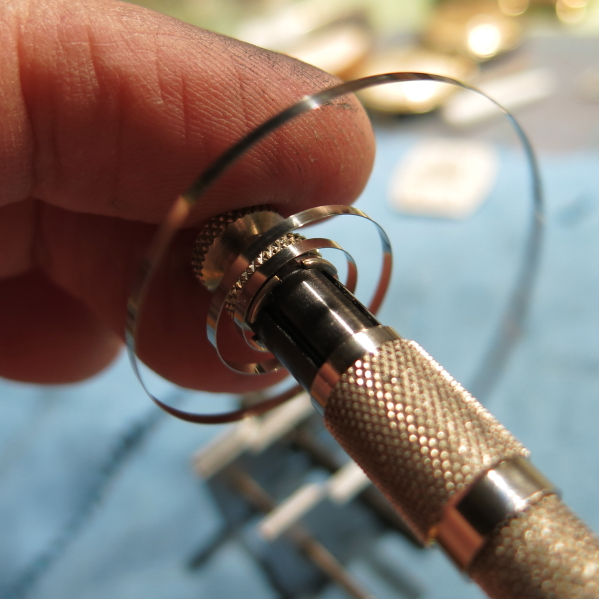 The CLD line was "sealed" with a series of gaskets around the various seams… bezel, crystal, crown, etc. They weren't waterproof, just sealed from the environment in general. The K-300 was only available for two years. The new models introduced a numerical nomenclature that is defined by the case material. A 100-series watch is 18K gold, 200- is 14K, 300- is 10K, 400- is gold filled and 500- is stainless steel. 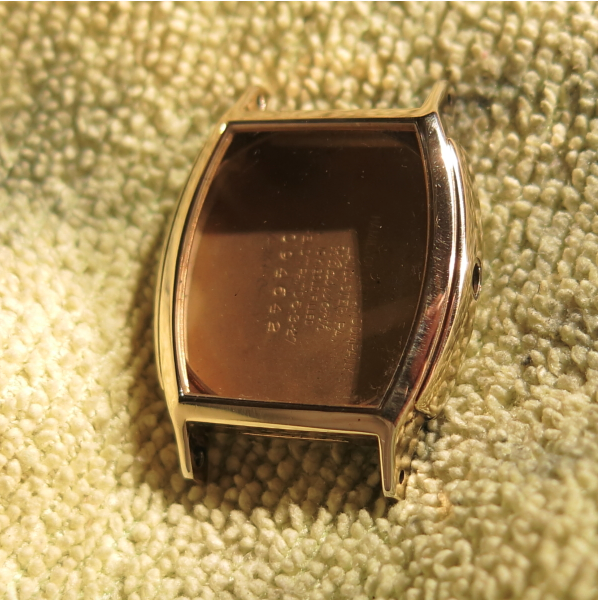 Eventually there were even 600-series watches with rolled gold plate. So with that in mind, you should know that the K-300 has a 10K solid gold case. 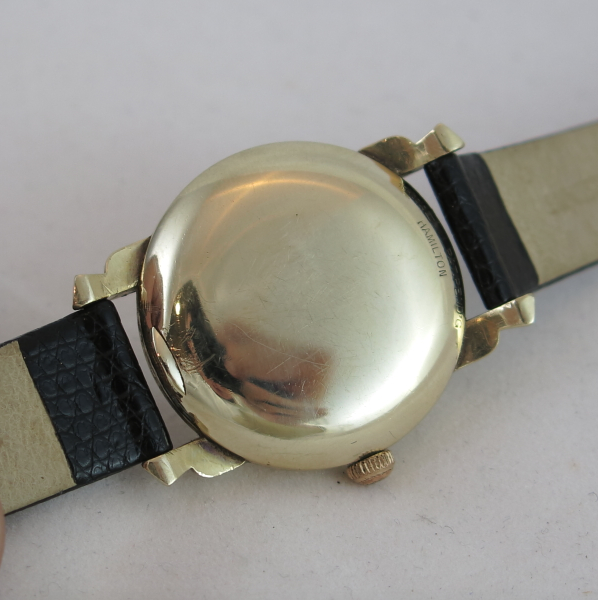 Like a lot of 1950's watches, the decorative lugs have a funky shape. 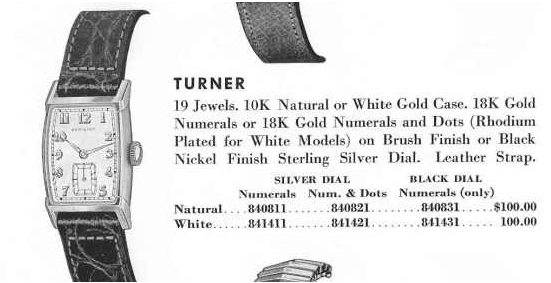 The silver dial features solid 18K numerals and markers with pearlised dots. I recently purchased a K-300 but I had to return it. I'll tell you why a little later. As received it was in very nice shape but it had a smudge across the top of the dial. I had hoped to be able to clean it off. 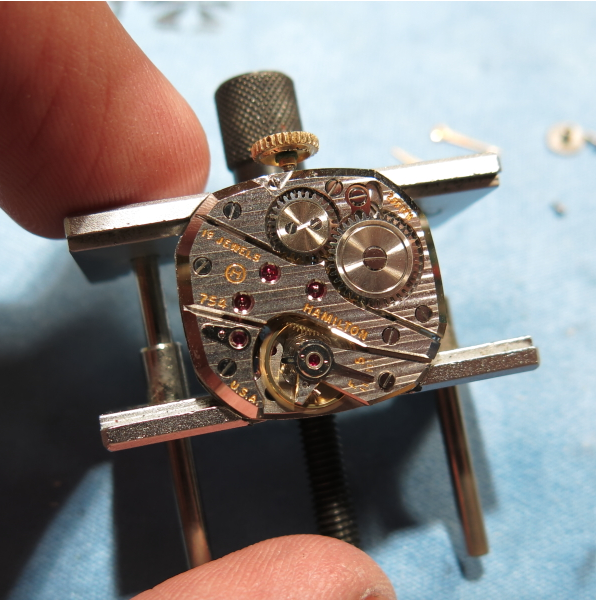 Most CLD watches have two-piece cases where the movement is held in the case back and the bezel pops off the front. 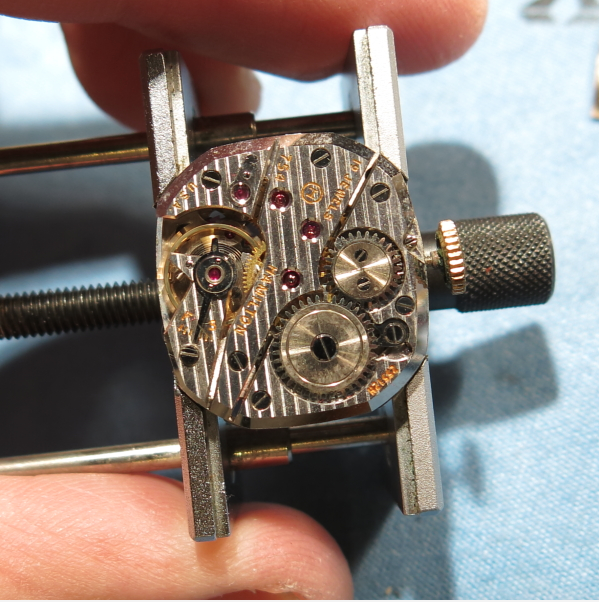 But the K-300 has a pop-off back and the movement is held in the front. And here's the movement. This is a very interesting movement. In fact, it was only used in the first automatics. There's no Hamilton number associated with it - it just says "Hamilton" on it. I had to do quite a bit of research to figure out what it is. Eterna-matics are made by Eterna, a Swiss watch company. They introduced automatics in the 1930's and their trademark is the 5 ball bearings in the center of the rotor. You can see them in the photo above. Those five ball bearings dramatically reduce the friction of the rotor and they became the logo of Eterna as well. Eterna also introduced a subsidiary, ETA - which is the maker of Hamilton movements today. Small world, huh? So why did I return the watch? Well, I couldn't get the movement out of the case! It needed to be serviced but it would not budge for me. 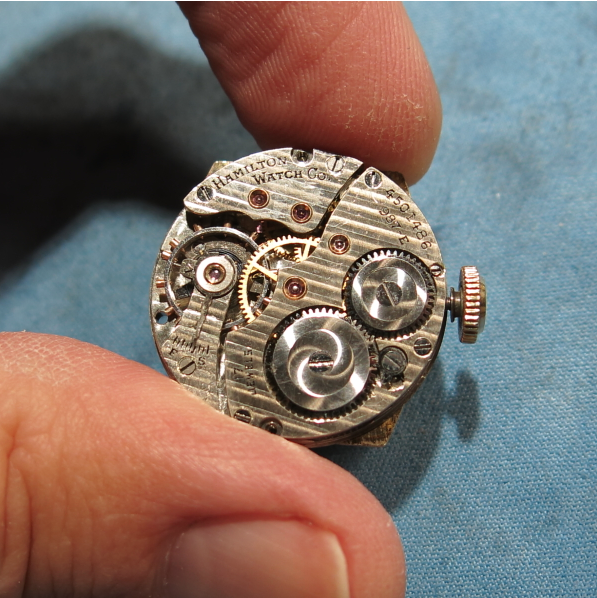 Others had tried before me, you can see some pry marks on the movement ring near the lugs. I was really bummed to return it but I was afraid I might damage it if I tried any harder to get it out. Goofing up an Eterna-matic would be a costly mistake for sure. Any other automatic, no problem - but try finding a loose Eterna-matic. 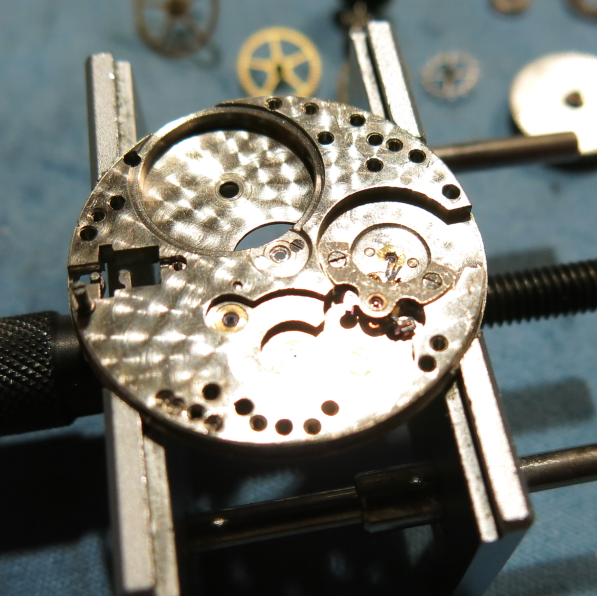 I suspect the gaskets around the movement ring must have hardened to the point they were a solid mass. You'd probably have to dig the gaskets out with a pick to free them up… or maybe soak them with something. Beats me. Returning it was the best option. Oddly enough, I know the person who bought it after me and I helped them send it to a professional watchmaker for service. I'm really curious to see how it turned out because it's a very nice and uncommon model. I also want to know how they got the movement out! Turns out there's not much of a mystery. 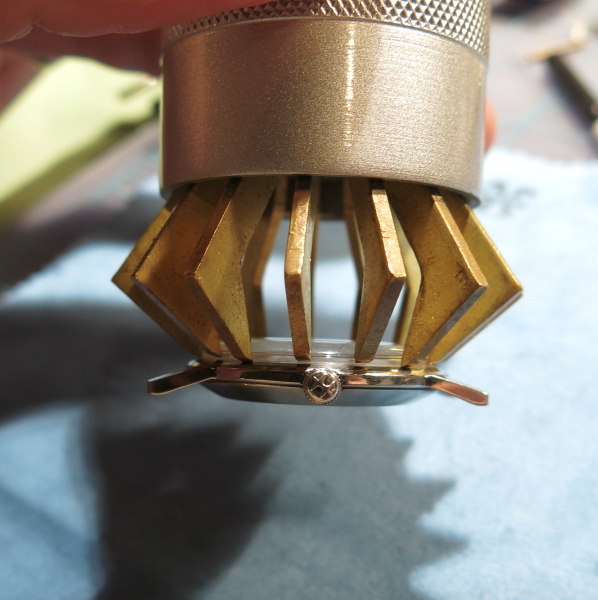 Once the stem is removed the movement and movement ring come out the back with a little persuasion. 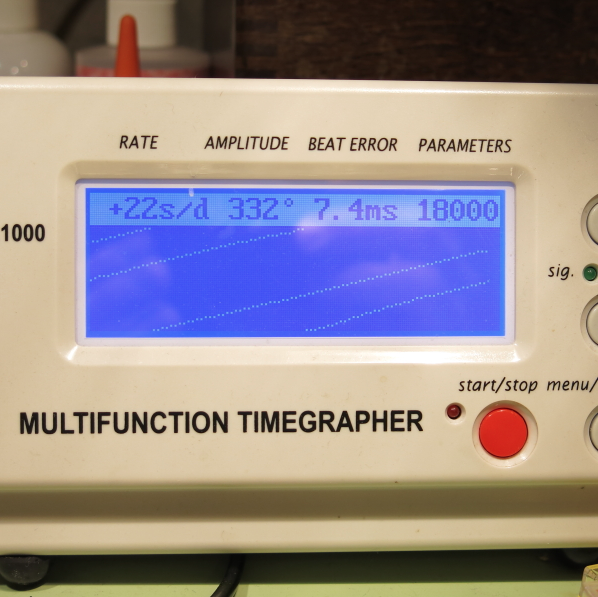 One option is to remove the crystal and push on the dial. It's not unusual to see Hamilton watches with diamonds on the dial. In fact, you will come across them for sale all the time but you need to be wary of them because they are often not authentic Hamilton models. A great example of a common, non-authentic model is often described as a "Top Hat". If you look on eBay at any given time for a "Hamilton Top Hat" you're sure to find one or two. 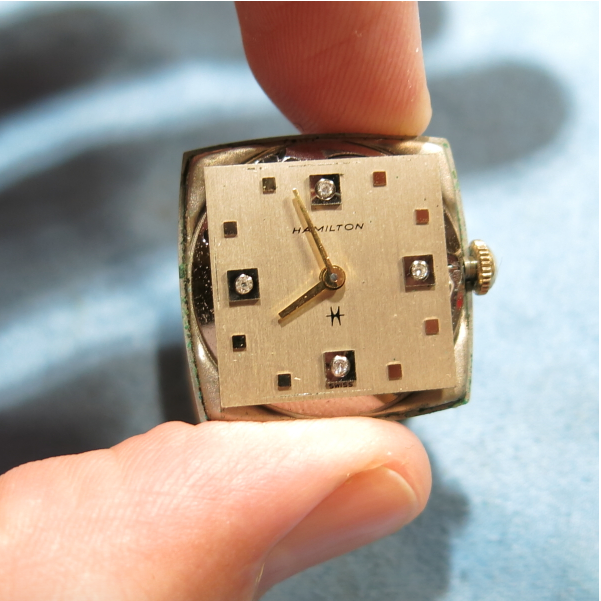 Diamond watches are often cased in white gold or platinum - or at least represented as such. The backstory to them is that Hamilton movements were so highly regarded that jewelers would case loose movement in a "jewelers case". 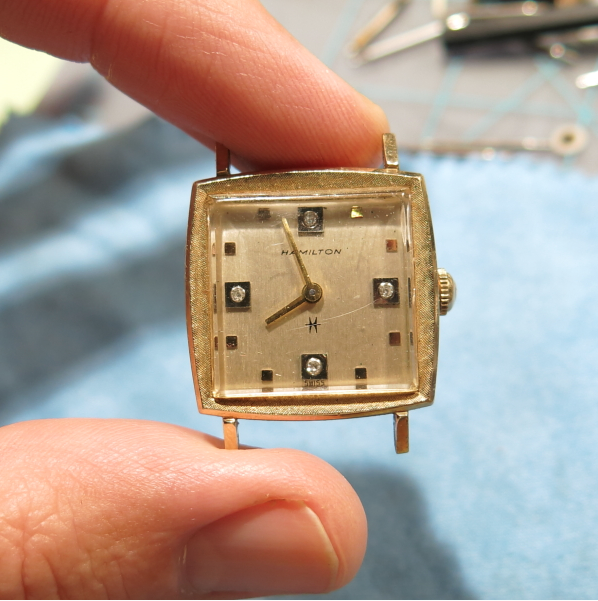 Movements could be taken from older watches with worn out cases or, especially in ladies watches, the jeweler would buy a new gold filled watch, repurpose the movement and then scrap the case. Hamilton hated the practice and tried very hard to discourage it as best it could but it continued nonetheless. So the real question, is how do you identify a "real" Hamilton from a "jobber"? The best answer is to look inside the case back. 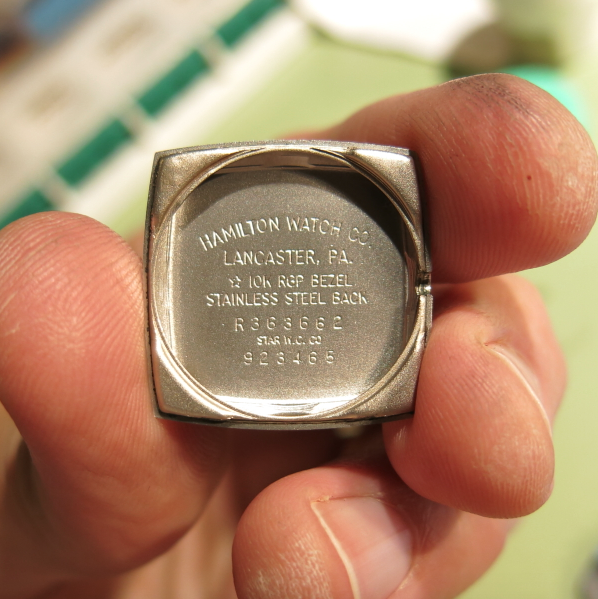 It should say "Hamilton Watch Company, Lancaster PA" along with the serial number, material, etc. 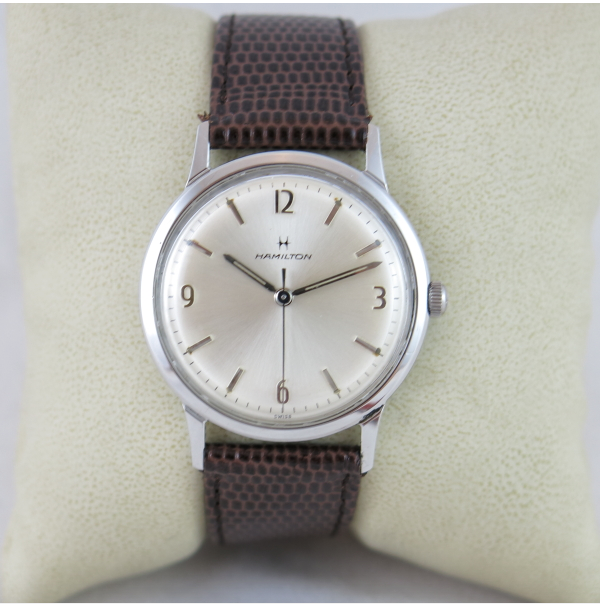 If it doesn't say Hamilton Watch Company, Lancaster PA - it's not an authentic model… end of story. 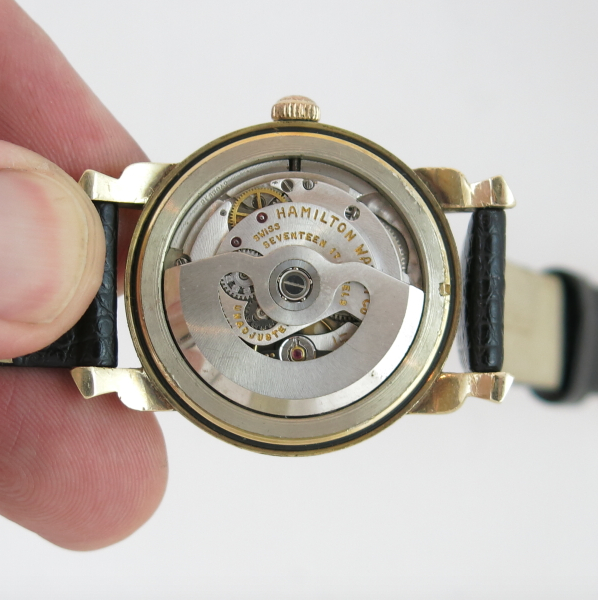 A common question is what's a watch like the "Hamilton Top Hat" worth? It's true value is whatever the gold content is plus a value of a spare movement… so maybe $350- $450, depending on gold content, weight, etc. In the end, the value is nowhere near the $2,600 you'll see them for sale. 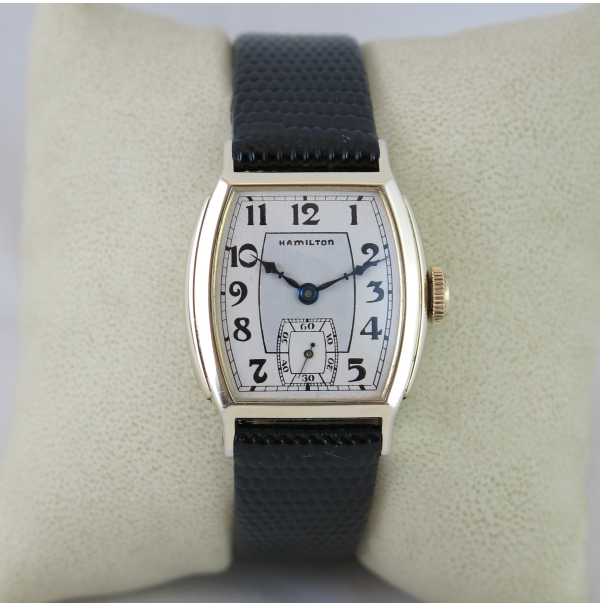 But there are actually a good many authentic models with diamond dials and they are very collectible. Many of them fall into the Lord Lancaster series, introduced in 1963. Lord Lancasters come in all sorts of shapes and sizes, with electric, mechanical and automatic movements. 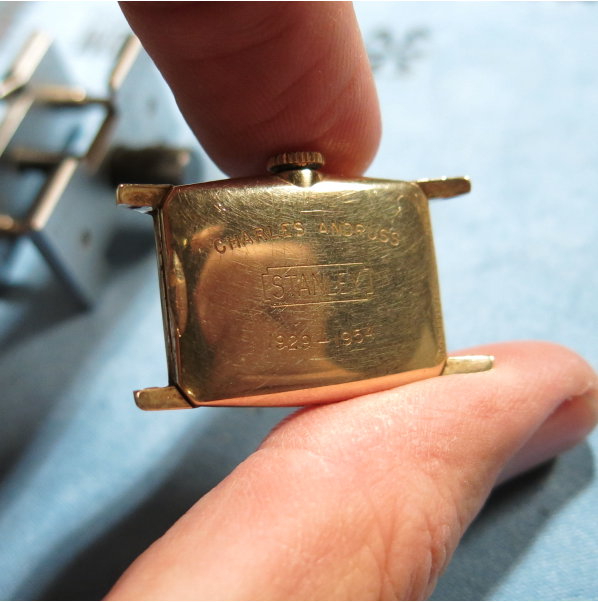 Cases can be solid gold, gold filled or rolled gold plate… you name it. Many times they are white, but sometimes they were available in yellow too. One of the white automatic models was the 1965 Lord Lancaster H. It was produced through 1969. The Lord Lancaster H is outfitted with a 17 jewel 694A Swiss-made movement. The watch has a fancy reflector ring inside the crystal to make the watch sparkle. The diamonds are set in faceted hour markers. So Lord Lancaster H offers a lot of "bling". Most of the time Lord Lancaster watches came on special black straps of varied designs and occasionally special bracelets too. 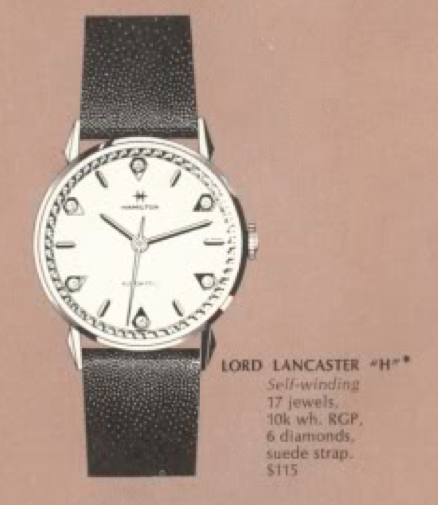 But the Lord Lancaster H came on a simple black suede strap. I had a Lord Lancaster H a while back and I sold it. It's one of the few watches I have an occasional minor twinge of "sellers regret". Perhaps I will find another someday…. 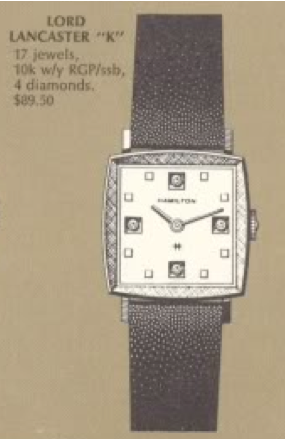 In 1964 Hamilton included a line of men's and lady's watches with M- or F- model names in their catalog. M for male and F for female, I suppose. Some are similar to other models in the Hamilton line up but with slight differences in the dials or crystals. There are about a dozen different models for each gender in the 1964 catalog. As I understand it, M and F watches were produced from 1961 through 1967 but I've only seen images of them in the 1964 catalog. One of the 1964 men's models is the M 69-2. The M 69-2 came in a one-piece stainless steel case with a white dial along with luminous hands and dots at the hour markers. Under the dial is a Swiss-made Hamilton 688 movement. I recently acquired an example of an M 69-2 that was not running and had a broken stem so the crown would come off when you set the time. The 688 is an ETA movement and shares the stem with several other ETA movements so I had a spare on hand for an easy fix. So really the watch just needed a good cleaning and a crystal replacement. One piece case are usually opened with a diabolical looking claw tool called a crystal lift. The tool compresses around the circumference of the crystal and squeezes the diameter enough that you can pull the crystal off. It goes back on the same way. 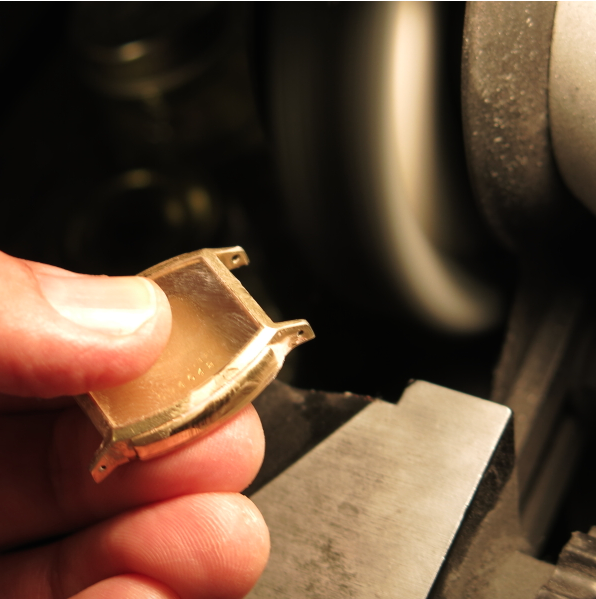 Just release the pressure and the crystal expands into the bezel, making a waterproof seal. Since the case is one piece, the stem has to be two pieces so you can pull the movement out the front. In the shot below, you can see the female portion of the stem. It engages a corresponding male portion in the crown and allows you to wind the watch or set the time. If you pull the crown really hard it will pop out of the female portion. However, you can also lift the movement out with the crown in place - if you're careful. 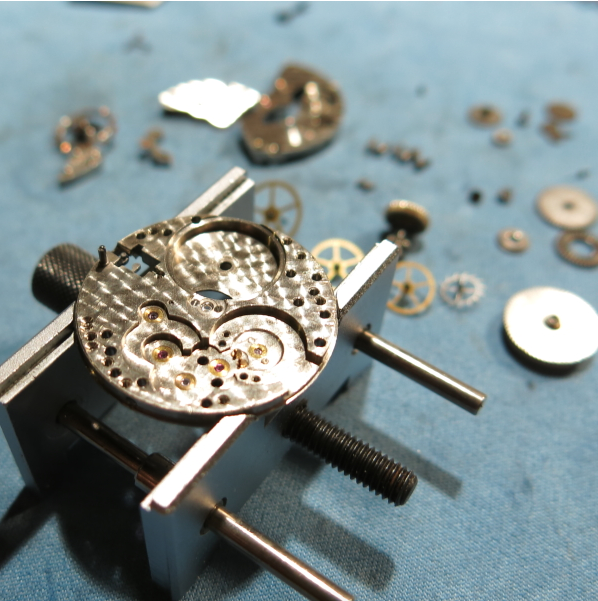 Servicing the movement is pretty straightforward and like the 686 movement in the Gary I recently showed, the 688 also has an adjustable hairspring stud so the beat error can be fine-tuned. And here's a shot of the finished product - all cleaned up, running great and with a new crystal. It's a very sharp, clean looking watch with a classic 1960's styling, I think.